entreVIEW: You May Want to Hang on to that Day Job . . . In case you haven’t noticed, it’s the start of a new year. For many, that means executing on New Year’s resolutions. Do your resolutions include ditching your day job and throwing yourself headfirst into an entrepreneurial venture? Well, as summarized in this article, according to recent research out of the University of Wisconsin-Madison (Go Badgers! ), you may want to hold that thought. While completing their graduate studies at the Wisconsin School of Business, Joseph Raffiee (MBA ’10 and Ph.D. ’16) and Jie Feng (Ph.D. ’15), now assistant professors at USC’s Marshall School of Business and Rutgers University, respectively, conducted research comparing the tendencies of “hybrid entrepreneurs,” or those who adhere to a risk-aversion theory, with people who take more of the traditional approach to entrepreneurship, i.e., diving in. As it turns out, the story of the tortoise and the hare plays itself out in entrepreneurship—they found that hybrid entrepreneurs who wait to quit their day jobs until their new businesses show clear potential are 33% less likely to fail than those who take the more traditional approach. Their research was supported by examples from both small businesses and large corporations, including eBay and Nike. One of their key takeaways was that this is good news for people who might want to be entrepreneurs but fear they don’t have the risk-taking mentality to succeed. 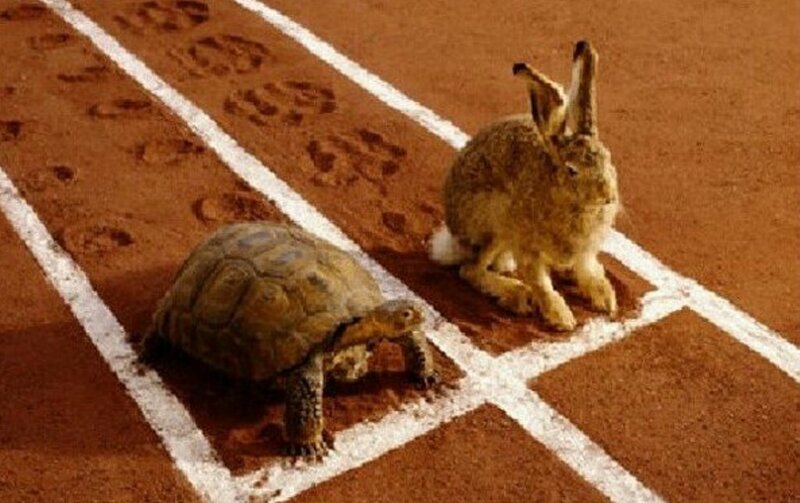 As the tortoise and the hare taught us, slow and steady wins the race!